Forged from the hardest metal on earth. We're laying down a challenge for your finger. Can it handle a ring made from one of the toughest materials on planet earth? Tungsten, discovered in 1781, has both the highest melting point and the highest tensile strength of any metal, and has been used in knives, drills, bullets, cannon shells, ballistic missiles and even on a vehicle that successfully landed on Mars in 2012. Still think your finger can handle it? 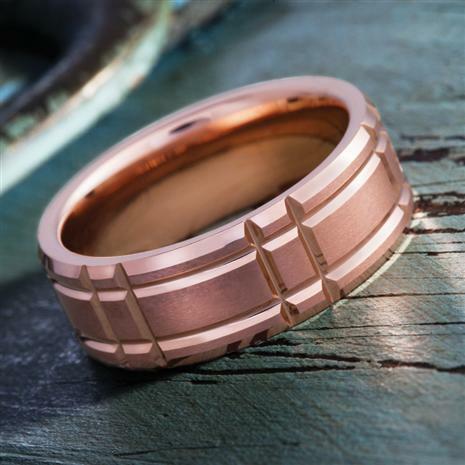 The Tungsten Challenge Ring features a rectangle cut design that was no easy feat. The effort and precision it took to forge the cut design was a trial of strength, and the end result is the toughest ring on the market with the most hard-earned design element. The only thing that's not tough about the Tungsten Challenge Ring is the price. At this exclusive Stauer price, it's a pretty easy decision. We know your wallet can handle it, but how about your finger?